209 The Pavilion01263 715779work01603 870304fax Self-cateringThis attractive apartment is situated in the wonderful development of the former Norfolk and Norwich Hospital. Perfect for a city break, the property is well equipped, spacious and provides a welcoming base to return to after enjoying the vibrant culture of the City of Norwich. The added attraction of secure parking gives peace of mind. • Other: Bed linen, towels and books provided. Notes: £20 deposit required for entrance gate key fob, payable to owner two weeks before start of holiday and refunded on return. Apartment situated in wing to left of main building. 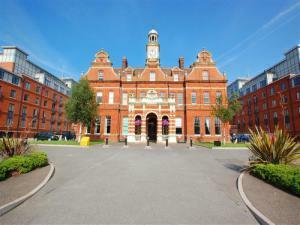 This attractive apartment is situated in the wonderful development of the former Norfolk and Norwich Hospital. Perfect for a city break, the property is well equipped, spacious and provides a welcoming base to return to after enjoying the vibrant culture of the City of Norwich. The added attraction of secure parking gives peace of mind.